Copyright © 2000-2012 American Scientific Publishers. All rights reserved. 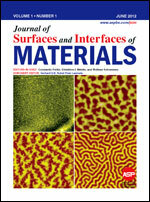 Journal of Surfaces and Interfaces of Materials (JSIM) is a multidisciplinary peer-reviewed international journal consolidating research activities in all experimental and theoretical aspects of surfaces and interfaces of materials, nanoscale engineering and manufacturing science into a single and unique reference source. This journal provides an international forum for scientists, engineers, biologists, researchers, and academicians working in the field of surface science and engineering, manufacturing science, processing technology and related applications.